George Graham Reviews Madeleine Peyroux's "Careless Love"
The chanteuse as a style has certainly taken on renewed prominence in recent years. The role of the romantic, ballad singing female vocalist has a long history, with the peak period probably being around World War II. As the language origin of the term would imply, the style has connections to France, with the late Edith Piaf being a kind of archetype. But the jazz age gave us singers like Billie Holiday and Josephine Baker. Today, the considerable popularity of Norah Jones has given rise to releases by other singers in a similar vein. This week we have the new CD by a classic-style chanteuse; indeed one who spends a lot of her time in Paris, Madeleine Peyroux. Her new recording is called Careless Love. Ms. Peyroux has had a interesting career. Her first CD appeared in 1996, almost seven years before Norah Jones' career-launching CD Come Away with Me. Madeleine Peyroux was born in Georgia but moved to France at an early age, growing up there after her parents separated. She quickly absorbed French culture, eventually singing as a street musician in the Latin Quarter, and became a member of two groups, with one of which, the Lost Wandering Blues and Jazz Band, she toured Europe. On a trip back to the US, she was spotted singing in a New York club by a record executive and was signed, at age 22 to a major label. She released Dreamland in 1996 to rave reviews. Ms. Peyroux was often compared to the late Billie Holiday for her somewhat husky-sounding alto voice with the ability to wrap around a song seductively. But unlike some singers who strove to emulate Ms. Holiday exactly, Ms. Peyroux brought a different personal vocal approach, avoiding the mannerisms that Billie Holiday imitators are careful to include. Her talent belied her young age, being able to bring a surprisingly mature mature vocal perspective to the songs she performed on her CD. All that media attention, including being called the next Billie Holiday, proved to be a bit much for Ms. Peyroux. So she moved back to Paris and greatly reduced her profile. Many of us thought that she would be one of those classic one-album artists, who puts out one brilliant record and are never heard from again. But now, fully eight years after her debut recording, Ms. Peyroux has decided to return to the recording scene, with a musically outstanding sophomore release called Careless Love, named after the W.C. Handy song that is included in a very clever arrangement. I say "musically outstanding" because of a serious sonic problem, with the recording, which I'll talk about later. The content of this CD is impressively diverse, including material running from Leonard Cohen to Bob Dylan to Hank Williams to the aforementioned W.C. Handy, to an old torch song in French from World War II, to one very nice original, co-written with Norah Jones collaborator Jesse Harris. Through it all Ms. Peyroux serves up the songs with the perfect combination of world-weariness with playfulness. She can sing ballads with the best of them, but also can take songs in unexpected directions, as she does with the Dylan and Cohen compositions. She is joined by a fine band, including jazz keyboard man Larry Goldings, bassist David Piltch, guitarist Dean Parks and drummer Jay Bellerose. Serving as producer is Larry Klein, who has performed similar duties with Joni Mitchell and Shawn Colvin. While Ms. Peyroux's debut CD was impressive for an artist at such a young age, this recording shines by moving beyond of novelty of the artist's youth. The eight years since then have not been wasted. She sounds more confident and has further carved out her own vocal approach. It has been eight years Madeleine Peyroux' widely-acclaimed debut album that had her, at age 22, celebrated by some in the press as the reincarnation of Billie Holiday. After retreating from the limelight for a long time, Ms. Peyroux is back with an recording that shows her maturity and the development her own voice. By any measure she is a superb chanteuse, a wonderful interpreter of songs who can evoke myriad images with her marvelously controlled, subtle voice. And on this new CD, she can also show a wittier side in her creative interpretations of both familiar and obscure songs. All of that is enhanced by the excellent group of musicians who join her on Careless Love. Unfortunately, the CD has a major problem -- lousy audio quality. In our grading system, we'll be charitable to give it a "D plus." The recording is a poster child for the problem of excessive volume compression on CDs. Even the most subtle moments of the music are pushed to maximum volume all the time. There is no dynamic range in a style which depends on shades and nuance in performance. The compression is so bad that there is noticeable, and annoying distortion on Ms. Peyroux's vocals, the acoustic bass, and piano. I found the unrelenting in-your-face sound unpleasant and distracting, undermining the performance. This is all the more surprising with the credits showing the mastering engineer as Grammy-winner Bernie Grundman, and the record label as Rounder Records, usually known for very good sound. 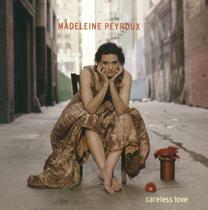 The performances on Madeleine Peyroux's new CD Careless Love are superb, but the bad sound makes it a CD that does not do well on a good sound system. Nevertheless, the musicianship, especially Ms. Peyroux's utterly charming vocals, make the CD worth considering.